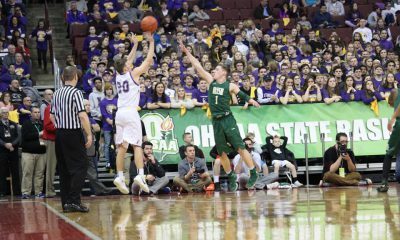 COLUMBUS, OHIO– St. Vincent-St. Mary used clutch free throw shooting (15-for-17, 88 percent) and strong rebounding (36-22 advantage) to bring home a second consecutive OHSAA Division II championship trophy to the LeBron James Arena in Akron. 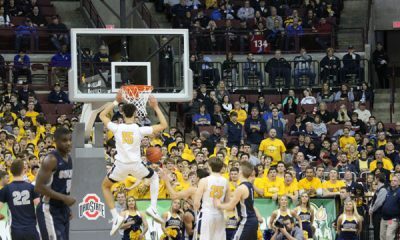 The Fighting Irish defeated the Trotwood Madison Rams, 60-51, in the Ohio State University Value City Arena on Saturday evening. 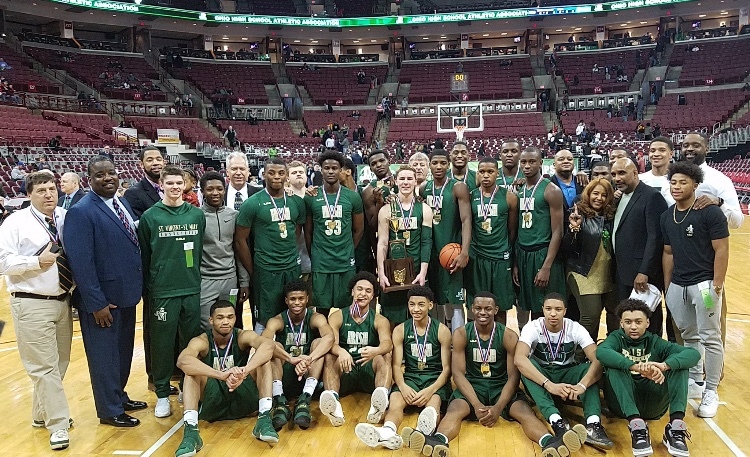 The title was the eighth in school history for SVSM—currently the highest number for any high school boys’ basketball program in Ohio. 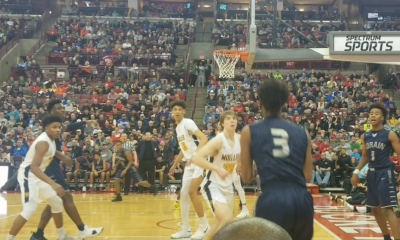 The Irish rolled out to a 14-7 first quarter lead, but three consecutive turnovers led to Trotwood closing the gap to 14-11 as the period ended. SVSM’s Scott Walter had seven first-quarter points to lead both teams. The second quarter was another close one. With 1:26 to play, the Rams’ Myles Belyeu hit a 3-pointer to give his team a brief 23-21 lead. Other than a 1-0 advantage on an early first quarter free throw, that would be the only lead of the game for Trotwood Madison. SVSM closed out the quarter with three baskets to take a 28-23 edge to the locker room at halftime. Lunden McDay had 12 halftime points to lead the Irish. SVSM picked up right where they left off to start quarter number three, hitting for another three consecutive baskets to take their largest lead of the game at 34-23. Trotwood called timeout, but the damage was done. The Rams played from behind the rest of the game. 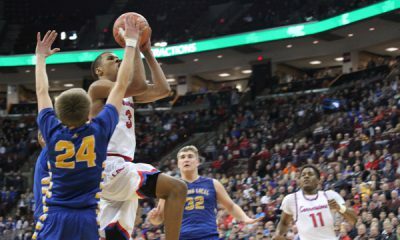 Trotwood’s Amare Davis stole the ball and went coast-to-coast for a layup as the third quarter buzzer sounded. The Rams trailed by just four at 39-35 and it looked like it might go right down to the wire. But St. Vincent-St. Mary cashed in at the free throw line, going 11-of-12 in the fourth quarter to seal the win. Walter was 6-for-6 and Keyshawn Jones was 4-for-4 on free throws in the final period. Leading scorers for SVSM (21-8) were McDay with 19, Walter with 17 and Jones with 10 points. Trotwood (26-4) had 20 points from Belyeu and 19 from Davis at the top of their score sheet.